Although we have plenty of excellent food served to us at our office, sometimes, we just want donuts. And donuts are against the company policy as something that can be served by the cafe, so, we have to take matters into our own hands. It is always amusing to me to see what different people do when tasked to bring in donuts. Sometimes we wind up with crazy fancy, trendy donuts, like those from Pyscho donuts (remember those? Seriously epic!) Other times, its a box of Krispy Kreme. Usually, the offering is something in-between those extremes, just donuts from whatever donut shop was near the house of the person who brought them in. Hence, I wound up with donuts from "China Express & Donut" one day. I haven't been there, but, as you might guess from the name, it is a combination Chinese restaurant and donut shop, located in the Mission. From what I can tell, it isn't even really a restaurant, more like a counter on one side with donuts, a counter with steam trays on the other with pre-made Chinese food. They have neon signs. Let's just say ... I didn't have high expectations, but, the donuts did come in a classic pink box, so, points for that. 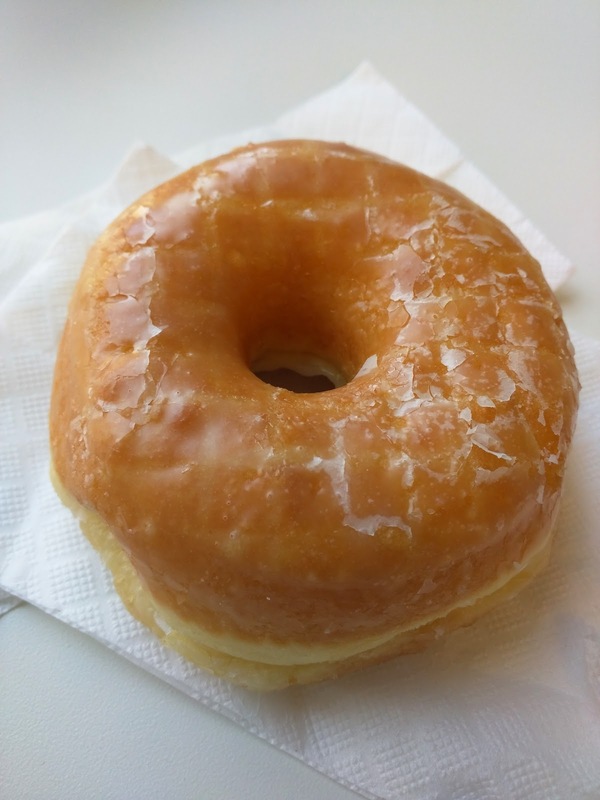 This was actually a pretty good, classic donut. It was light and fluffy, with a nice amount of glaze that covered both the top AND the bottom. Points for the glaze job. It did have a slight bad fried taste, just a bit too fried, or the oil a bit too stale. But it was far better than any donut I've had from Posh or even than Krispy Kreme, so, better than average? On my recent journey to Sydney, we decided to fly on American Airlines through LAX, even though Qantas now offers a direct flight from SFO. It was a chance to try something new, since I haven't flown internationally on American before in business class. 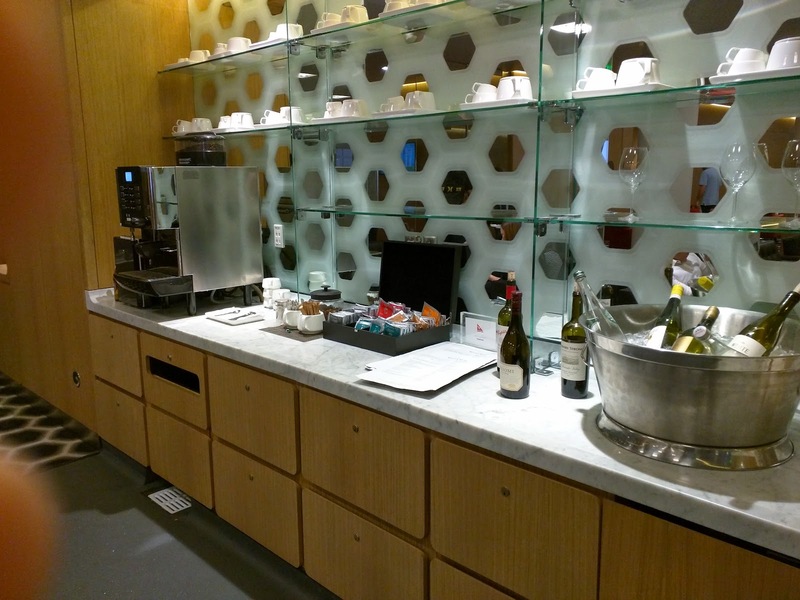 As part of our voyage, I made sure we'd have enough connection time at LAX to check out the Qantas lounges. 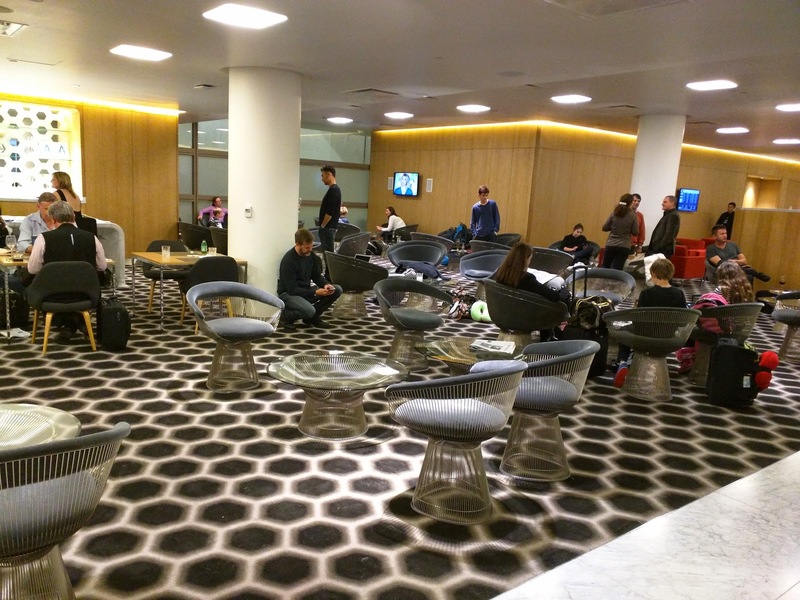 I visited the First Class lounge soon after it first opened (see my original review) and wasn't impressed, but friends have told me it got much better. So, even though it required re-clearing security twice, we took a venture over to the International Terminal (our flight was out of Terminal 4, even though it was an international flight). A hassle, for sure, but, they have now opened the airside connector, so you won't experience this additional effort. Was it worth it? I'm not really sure. I guess I would have been bored in Terminal 4 the entire time, but, the food really wasn't very good. Ojan enjoyed his selections though, and he was the one who actually wanted dinner at that time (I had been snacking away on the American Airlines snack mix (so addicting!) and was planning to eat more on the flight anyway, so I wasn't quite as into the food as usual). Anyway. 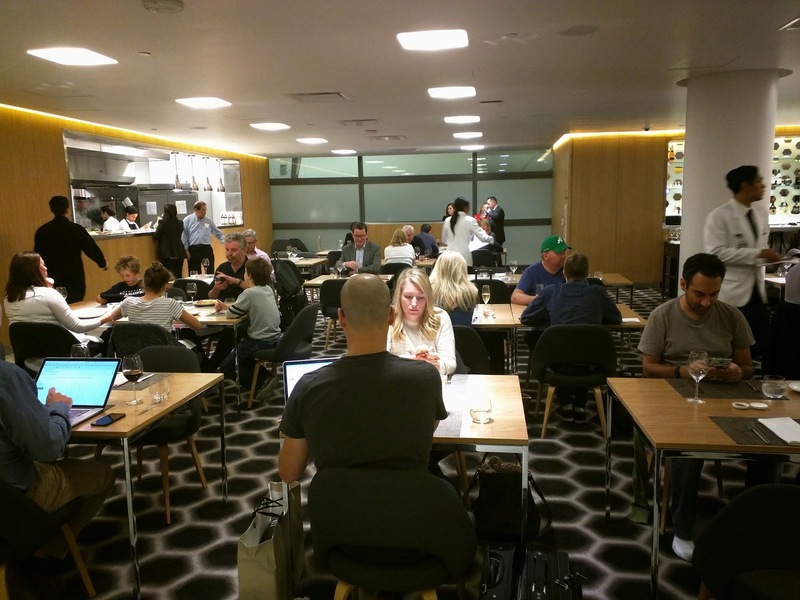 Still better than the LAX Admiral's Club, no question, but, not even remotely on par with the Qantas First lounge in Sydney. Snacks: Seasoned Nuts, Potato Chips. 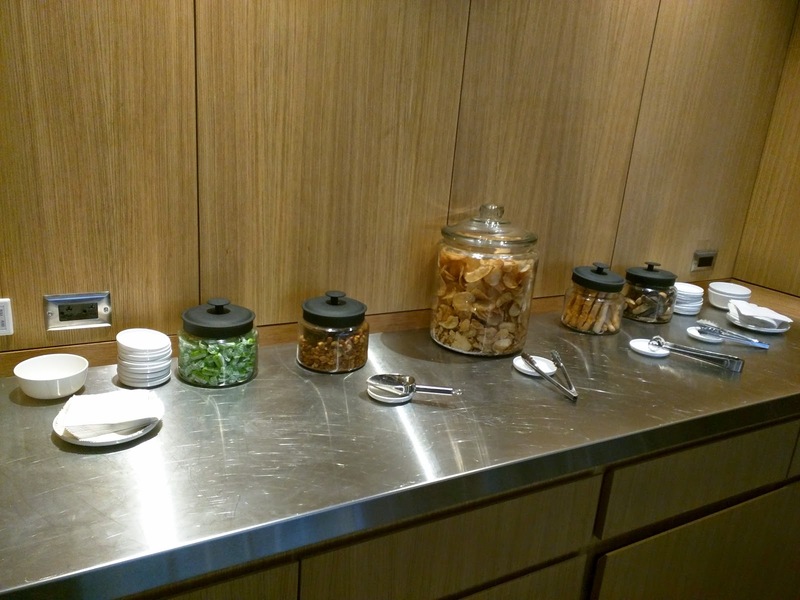 As before, the only self-serve snacks were seasoned nuts and potato chips. The chips were kinda burnt, and didn't have a great taste. For lounge snacks, these were both pretty weak offerings. I yearned for my AA snack mixes! 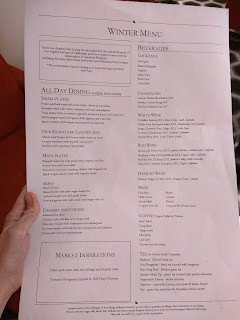 Winter All Day Dining Menu. We quickly moved into the dining room to have a meal, even though we knew we'd be fed a full dinner on the flight. Our previous experience in the lounge wasn't great, but it was a few years ago, right when they first opened, and I heard reports things got better. Plus, even if not great, the food there was certain to be better than what was served on the flight. 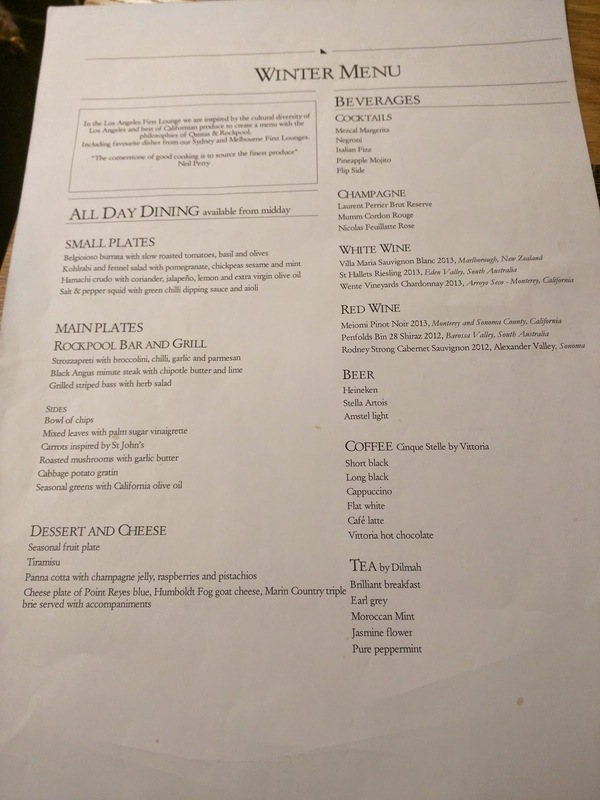 The menu is broken into several sections: Small Plates, Our Signature Sandwiches, Main Plates, Sides, Desserts & Cheese, and Market Inspirations. The small plates include their signature salt and pepper squid, a soup (potato and leek), a salad (with cherry tomatoes, avocado, and jalepeno), tuna tartare, and jamon serrano with burrata. 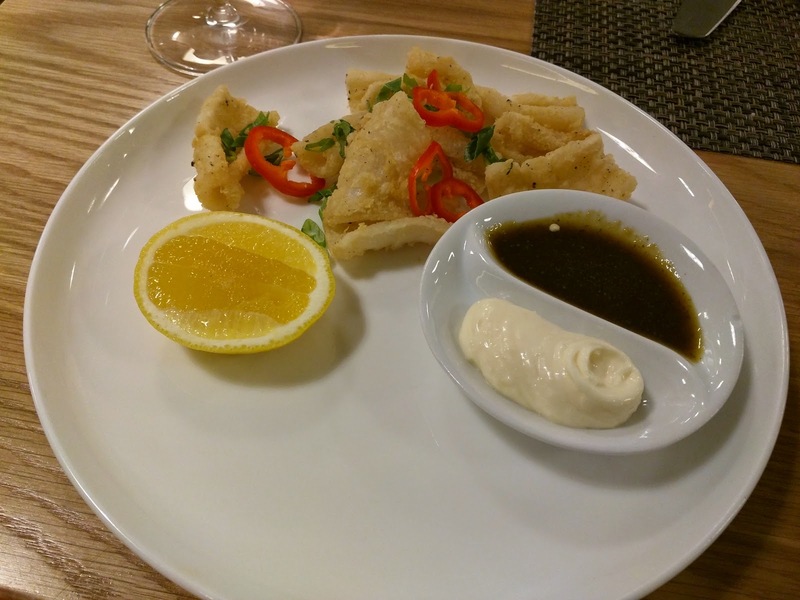 I would have gone for the burrata, but Ojan wasn't interested, and we wanted to try a bunch of things, so, we ruled it out, and stuck with the classic salt and pepper squid. We skipped the Signature Sandwiches, which included a burger, a croque monsieur, and a reuben. I'm not a sandwich girl, but both the rueben (pickles!) and the croque (melty cheese!) did call out to me for some strange reason. We also skipped the Main Plates, which included their signature minute steak with butter, a chicken and rice dish, a basic seared bass, and a veggie beet dish with barley. And we skipped the Sides, just chips (fries), sauteed mushrooms, and two very plain salads. I'm not quite sure why the "Market Inspirations" were titled that way, as there seems to be nothing really market driven about the two offerings: pulled pork tacos or fettucine bolognese, but those were the items that caught Ojan's eye, and since he was more hungry than I, we went with both of these picks. And finally, my category: dessert. The offerings weren't great - a fruit plate, a cheese plate, coconut trifle with lime and orange curd, chocolate fondant with raspberries, or an ice cream sundae. After a quick trip to the business lounge to check out their dessert offerings (more on that next week! ), I settled on the sundae. 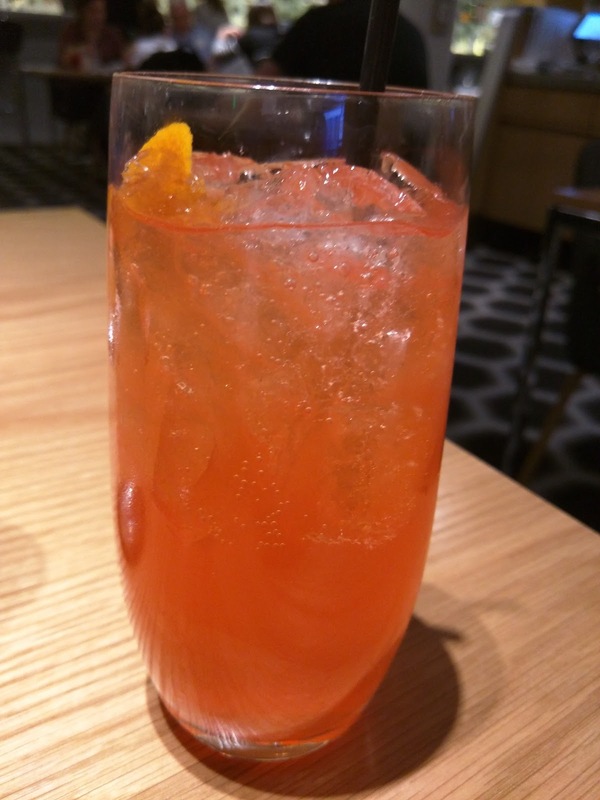 I decided to start with a cocktail, as the menu listed a handful. Except, it just had names, no descriptions. 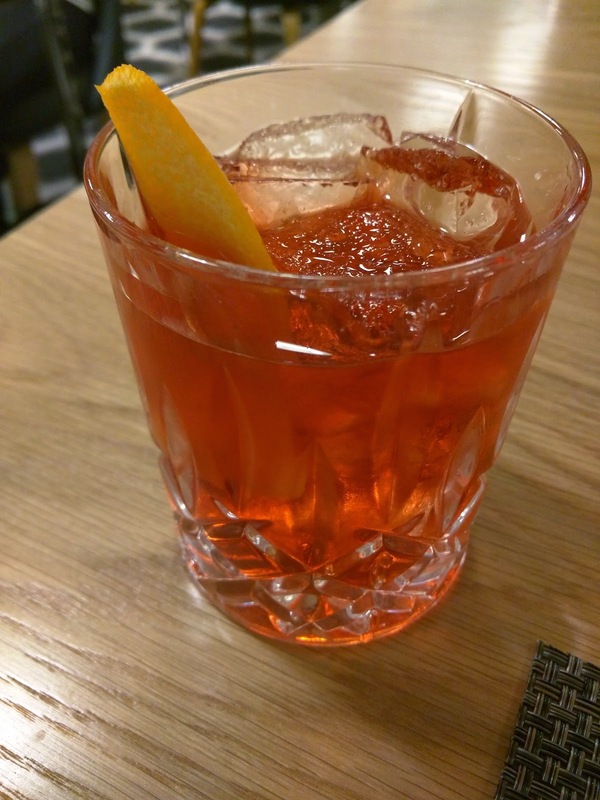 What was an Italian Fizz? I have no idea. It was ... sweet. It was bitter. And I didn't like it. I think I was in the mood for wine, not a cocktail. 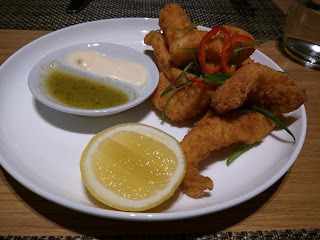 Small Plates: Salt & Pepper Squid with Green Chilli Dipping Sauce and Aioli. We started with the salt and pepper squid, a signature Qantas lounge offering. 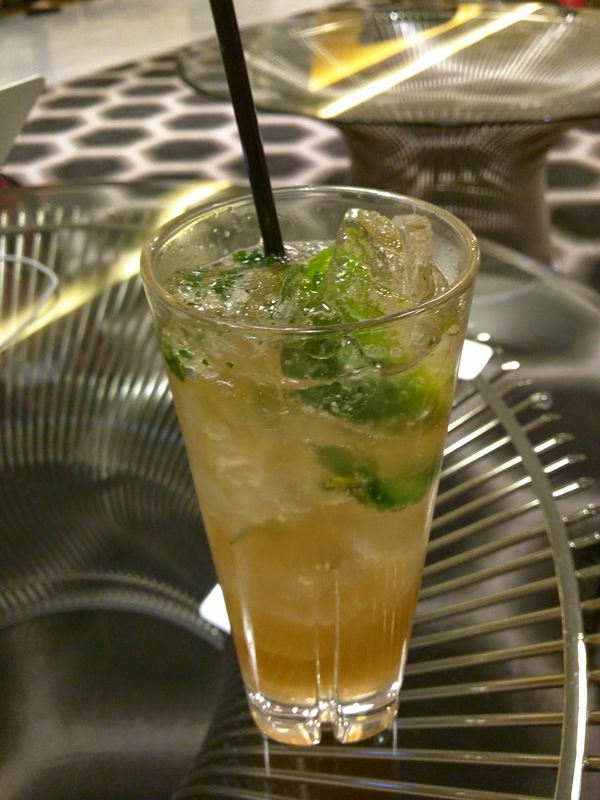 Last time, we didn't love it, but we have fond memories of it from all our visits to the Sydney First Class lounge. This time it was ... fine. I again didn't like the green sauce. I don't know what it is, but I really don't like the flavor. The aioli was really just mayonnaise ... it had no additional flavor at all. I did appreciate the lemon to squeeze over the squid. As for the squid, it wasn't rubbery, it wasn't too oily, it was well battered. But, it just wasn't that exciting. Inoffensive, but a bit boring. Some seasoning, in the batter or the aioli, really would have helped. Of course, if you wanted spice, all you had to do was take a bite of the red pepper. Soooo spicy! The food is clearly not cooked to order, as this arrived within 2 minutes of us ordering it. Great for being in a rush in the airport, although we weren't really pressed for time, and it was a bit crazy how fast things showed up. 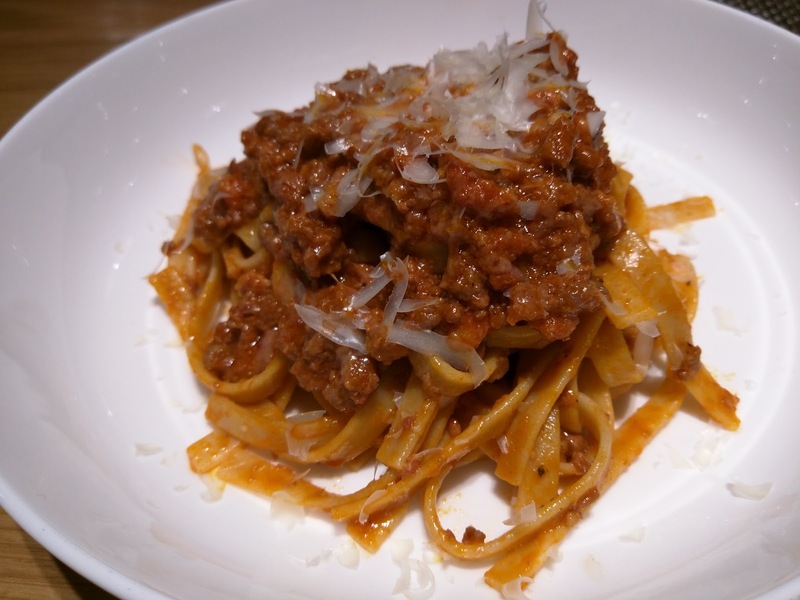 Market Inspirations: Fettucine Bolognese inspired by Neil Perry's Rosetta. For our first main dish, we went for the bolognese. I've strangely been really, really into pasta lately. Even when just served in the cafe at work, fairly generic dry pasta, cooked in batches ... I've loved it. So, pasta sounded good to me. I took one bite of this, and declared it Chef Boyardee. The pasta was this interesting texture, somehow both mushy and a bit too al dente, all at once, if that makes any sense. Like you sometimes get with gluten-free pasta. The sauce? Flavorless. It did have bits of ground beef and fresh cheese grated on top. We both found this very, very bland. It too was served quickly, arriving at our table only about 5 minutes after the first dish. 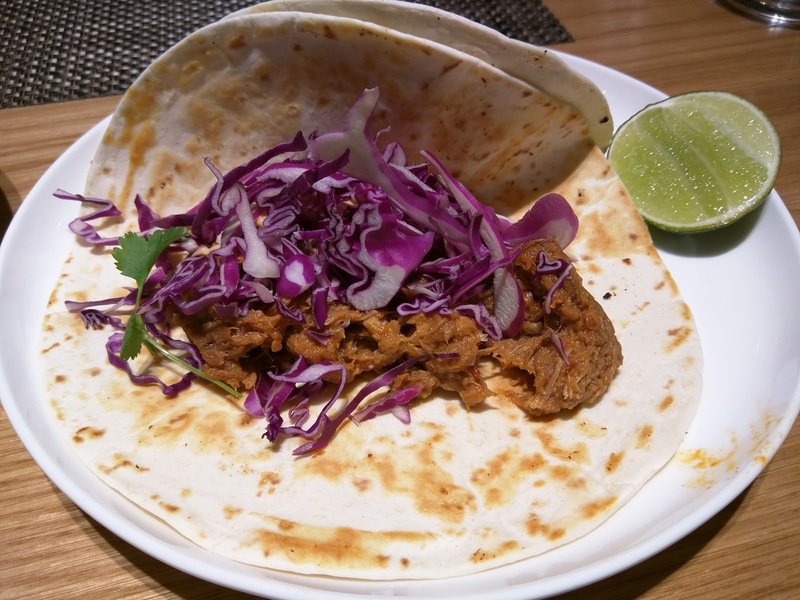 Market Inspirations: Pulled pork tacos with red cabbage and chipotle mayo. Along with the pasta, we got the other market inspiration: tacos. So, obviously this was entirely Ojan's order. I don't really like pork, I don't like tacos. The order came with two huge tacos though, so, obviously I had to try it. Much like the squid, it came with a lime to drizzle over, a nice touch. The taco shells were soft tacos, and, huge, far too much taco shell for the contents. They were crispy on the outside, and moist inside, as if they were cooked way in advance, and had been sitting in a steamer basket or something. Which I assume they were. The pork filling was pretty mushy, but it had a nice flavor. It wasn't bad. And then ... the chipotle mayo. Creamy, spicy, delicious. I ended up eating a ton of the pork, cabbage, and mayo, as they all combined together quite nicely. Crispy, soft, and creamy, all at once. And spicy. Did I mention, spicy? Ojan claimed that eating the bolognese after the taco was a good move, because your mouth came pre-spiced. Anyway, this was certainly the best thing we ate, mostly due to that aioli. Dessert: Ice cream sundae with strawberries, banana jam, and amaretti. 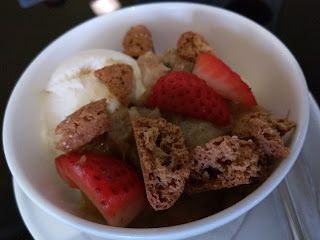 After a quick jaunt over to the business class lounge to check out their offerings (decent potato salad, but not much else), I returned to the lounge for dessert. I didn't want the trifle since it had orange and lime curd, both flavors that I don't care for, and I didn't want the chocolate dessert since it was late and I didn't want caffeine (and I knew that both dessert offerings on my flight were chocolate, doh), so, a sundae it was. It arrived in ... less than 2 minutes? I don't even understand how it possibly came so fast. The ice cream was just basic vanilla, but it wasn't bad. Ok creamy, not icy. On top was ... "banana jam". Um, this was just mushy banana. The strawberry slices weren't particularly ripe nor flavorful, as, well, it was January. 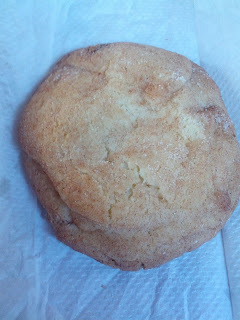 The amaretti cookie bits added some nice crunch, but, were just generic amaretti cookies. So, was this good? Not really. It needed a sauce. It needed fresh fruit. It needed whipped cream. But ... it was at least something sweet. They really need to work on the dessert line up! To get to Sydney, I had to connect in LAX. Now, normally I am not excited by the prospect of a layover, particularly in LA, but this time around, I was looking forward to it. Why? 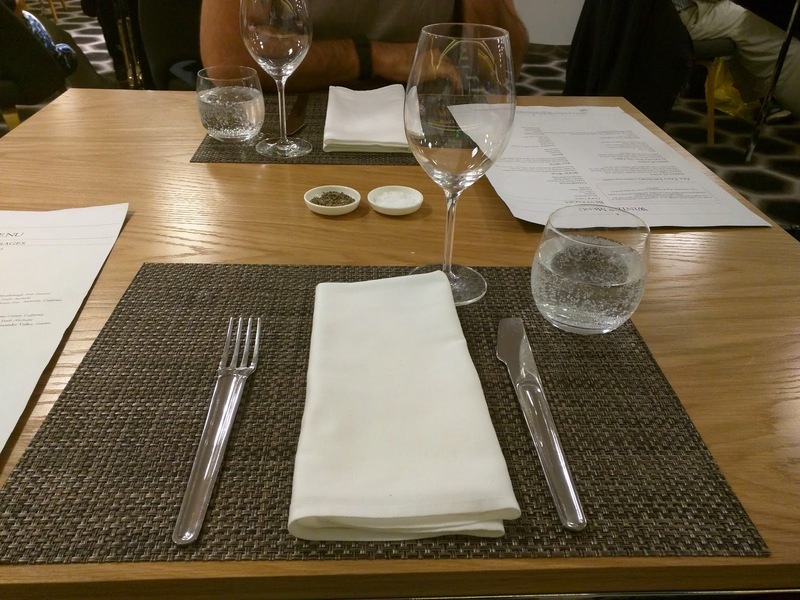 Because Qantas just opened their new lounges in the International Terminal, and I had access to the First Class lounge, complete with a full service sit down restaurant. If it was anything like the Sydney lounge, which I visited years ago, I knew I was in for a treat. Spoiler: No, it is not in the same calibre, at all, but, it is hard to rival that lounge. 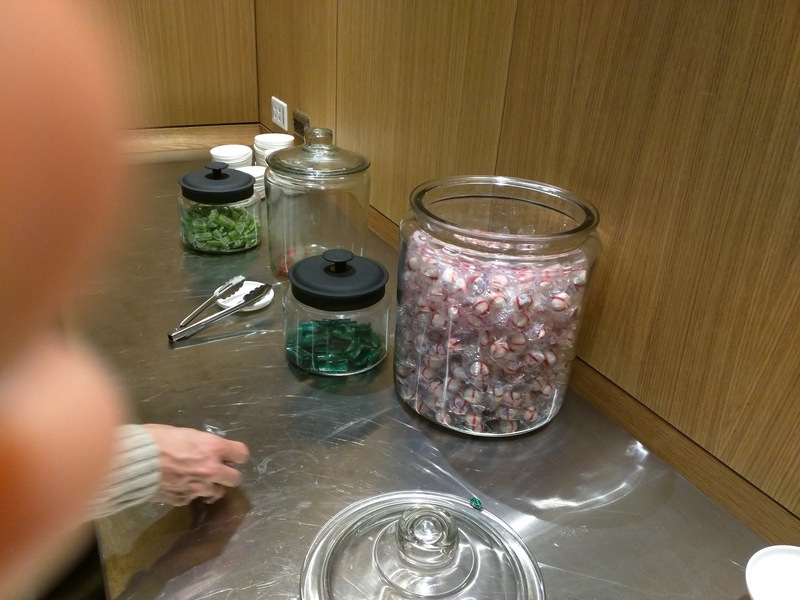 And yes, stay tuned for my review of the Sydney First Class lounge on my return journey. Then, on our way back to San Francisco, we had a rather long layover in LAX too, which again would normally really make me upset. But, my research lead me to discover a little known rule: you can actually go to the international terminal to use the lounges, even if you aren't flying internationally! It is a huge pain, since you have to clear customs when you arrive, re-check your bags, exit the terminal, and then find your way back to international departures, go back through security, re-assure every person that you encounter that you realize you are going into the international terminal not the domestic, and then, once you are ready to head to your real gate, you have to exit the international terminal, get to the correct domestic terminal, and go back through security in the domestic terminal. Don't do this if you have just an hour or two to kill. 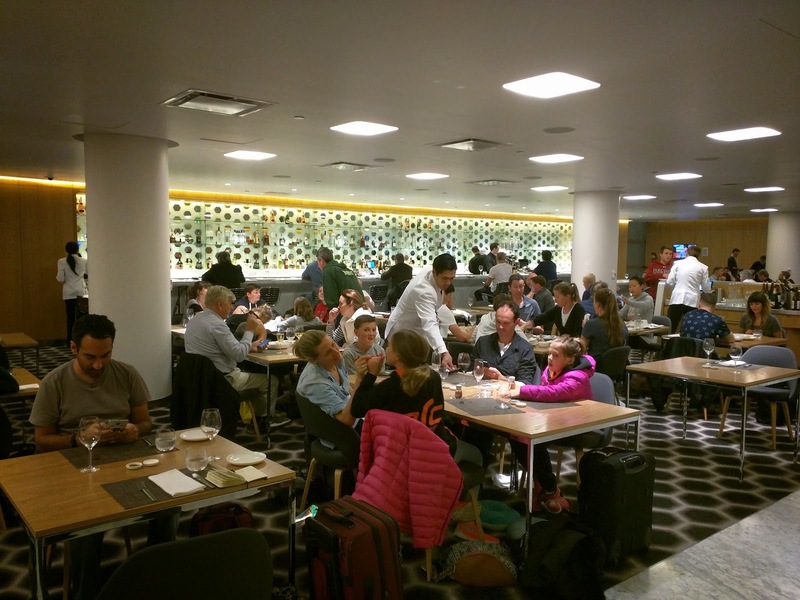 But, we had more than 4 hours, it was lunchtime, and even though we weren't super impressed with the lounges on our outgoing flight, we knew the American Airlines Admiral's Club waiting for us in the domestic terminal wouldn't compare. My first impression of the lounge: so loud. Not a calm, peaceful lounge. 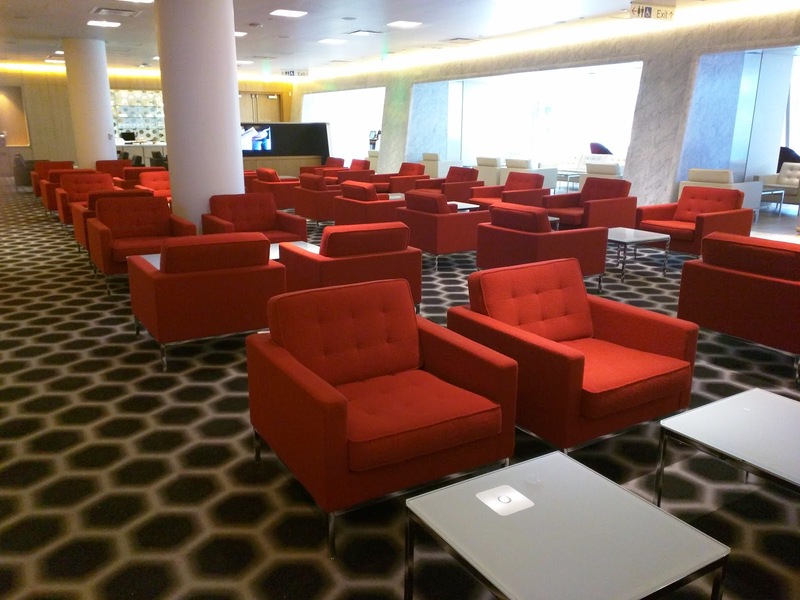 First Class lounges normally seem like an oasis in an airport, but not this one. I was stunned by the clamor. Since this is is Julie's Dining Club, I'll focus this review primarily on the food available, but I'll include some photos of the lounge space as well, just to give you a better sense of the environment. 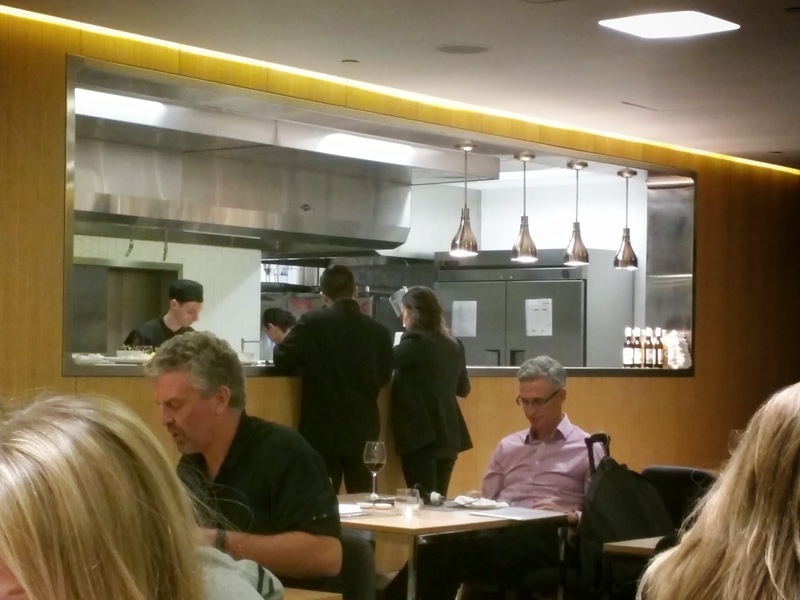 The food was ok, but paled in comparison to the Qantas lounge in Sydney or the Cathay Pacific lounge in Hong Kong. And, first world problem, they have no spa, so, no massages offered. The horrors! As I said, when we stopped back on our return flight, the lounge was basically empty. There were only 5 people total in the lounge, as it was early in the day, and no international flights depart until evening. A total different experience, but, since you'll likely be using the lounge in the evening, be prepared for chaos. Table service is offered in a more formal dining area, or from any seat in the lounge, since there is no other food available in buffets or snack stations. Nuts and candy, that is it. Place settings in formal dining area. The winter menu consists of small plates, mains, sides, and desserts. 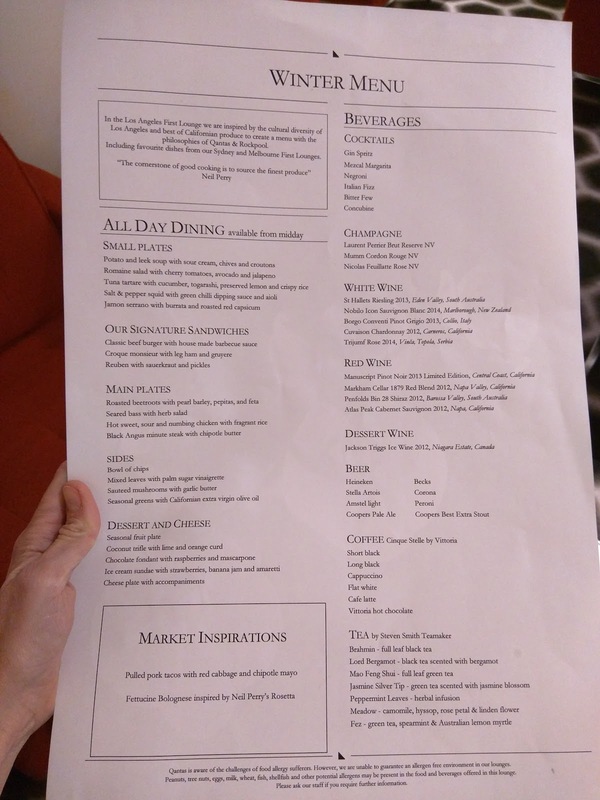 There is only one menu, the "All Day Dining" menu, since they aren't open in the morning for breakfast like the Sydney airport. 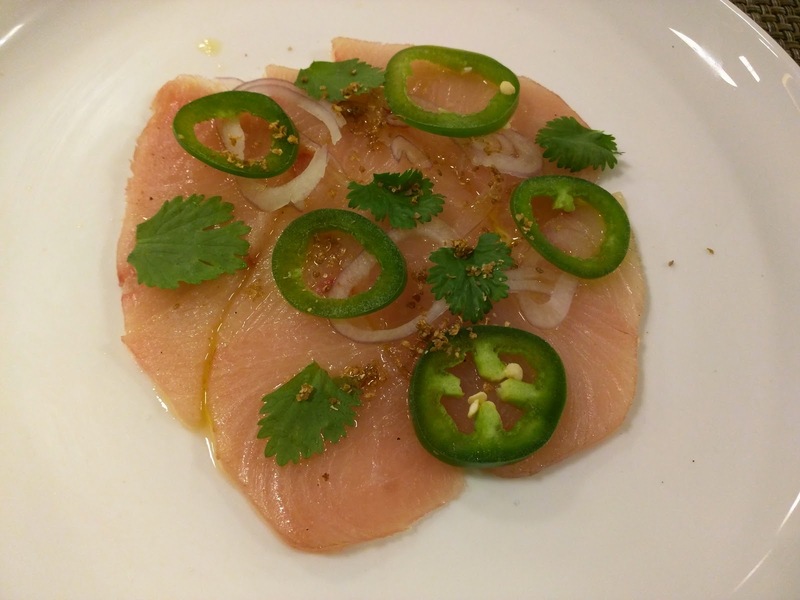 We skipped all of these on our first visit, but when we returned, Ojan decided to try the fish. I was somewhat curious what "carrots inspired by St. John's" were, and, on our return visit, I did end up ordering the cabbage potato gratin. Our neighbors ordered all the mains, so I got to check them out. The steak was really thin, and clearly well done ... as in, cooked very through. The fish also didn't look very impressive, no sauce included, so I know I wouldn't have cared for it. The pasta likewise looked pretty boring. Our neighbors also ordered green beans and fries, none of which looked great either. It isn't on the menu, but I saw children receiving plates of chicken fingers and fries. Overall, the menu was much smaller, and lacked the gusto of, the one in the Sydney lounge. As I'd soon find out, it wasn't just the menu that paled in comparision, the food preparation was also not up to par. Then again, the Sydney lounge sets a crazy high bar. 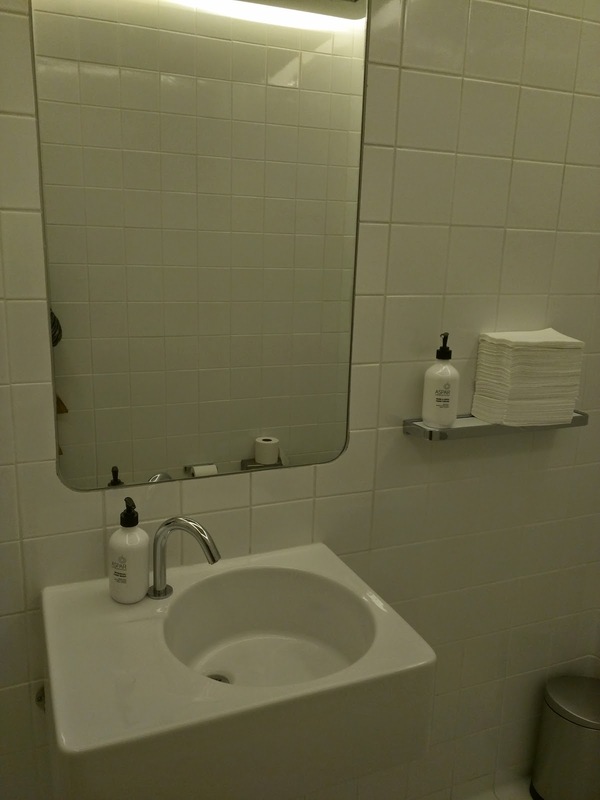 This is an airline lounge after all! The bar isn't really designed for you to walk up and order, since there is table service everywhere, but there are some seats available at the bar, mostly occupied by solo diners. Ojan likes all of these ingredients, but he also didn't care for the dish, although he couldn't pinpoint why. I'm not really sure why we ordered this anyway, I think I just wanted something light, given that heavy food and flying don't really go so well together. I didn't want tiramisu due to the late hour, and I wanted to have some chance of sleeping on the flight, so caffeine consumption was out. The only other options were a fruit platter or a cheese platter, so I had to settle for the panna cotta. Not that this is a bad thing, since you know I love panna cotta. 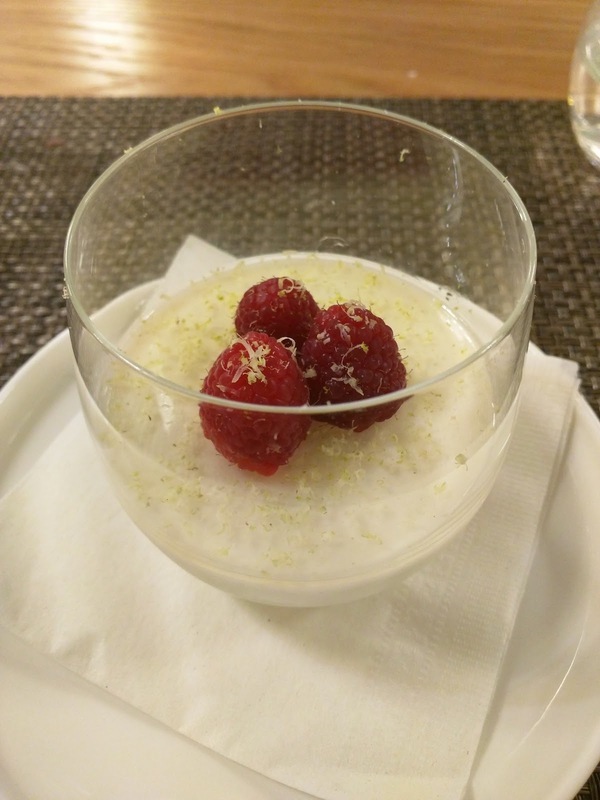 It was a good enough panna cotta. Very creamy, good buttermilk tang, well set. The champagne jelly on top was a bit strange, but Ojan liked it. In fact, Ojan loved this dessert. He kept commenting on how much he liked it, and easily devoured it. He also thought it was "light and fluffy", a point I contested. It was firm, well set panna cotta, totally not fluffy! Overall, this was fine, but no flavors really popped for me, but again, Ojan adored it. 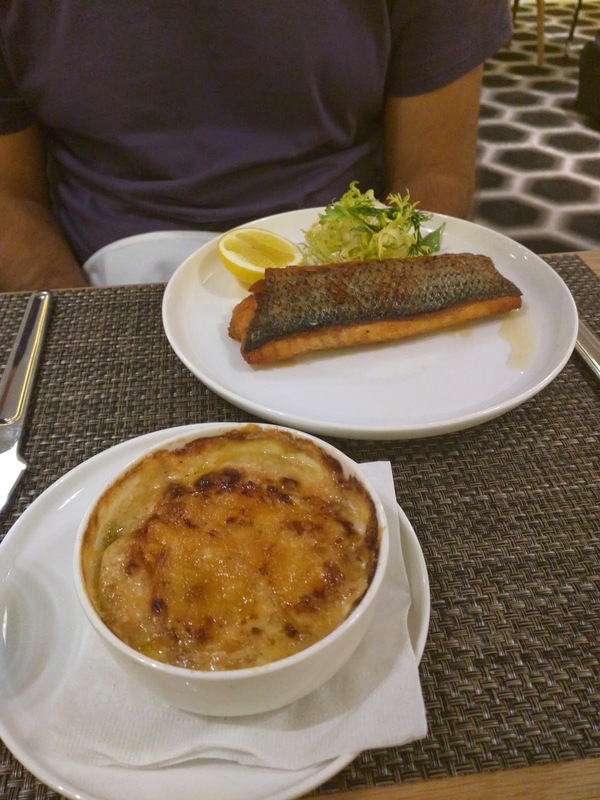 On our return visit, I was still full from my breakfast onboard and opted to eat salads over in the business lounge, but Ojan ordered the striped bass. I couldn't resist also adding in the gratin to his order. Because ... even if I was full, how do you resist cream and cheese? Since my return visit occurred during the day, I was able to order the tiramisu. Yes, I know I said the cream and cheese laden gratin was too heavy, and then went ahead and ordered a rich, heavy dessert. The rules all change when it comes to dessert. It was decent, but not great. A layered creation, with two layers of soggy cake, that didn't really seem soaked in any espresso, two layers of sweetened marscarpone, and topped with cocoa powder. 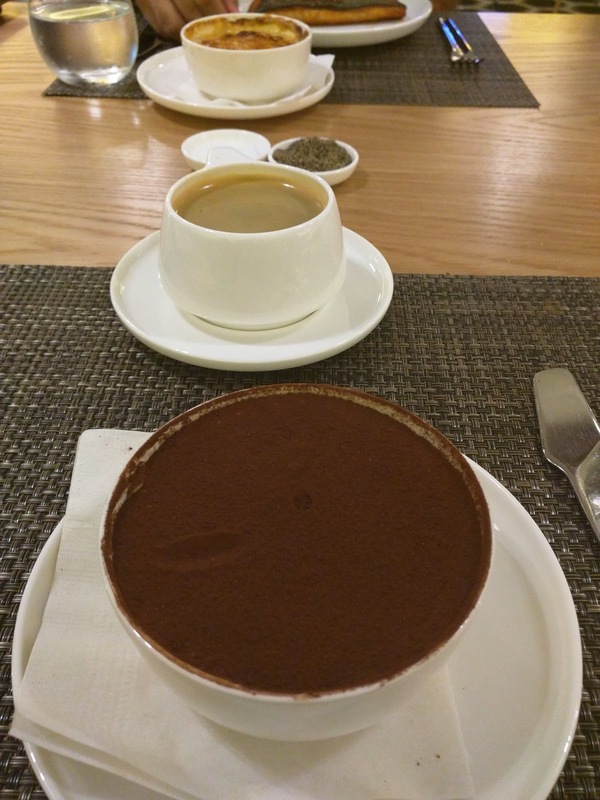 The cocoa layer was too thick, making it hard to eat without ingesting cocoa powder and choking, but I liked the sweet mascarpone pudding, particularly when paired with a decent decaf Americano. The portion size was rather insane for one person however, and Ojan didn't want any. 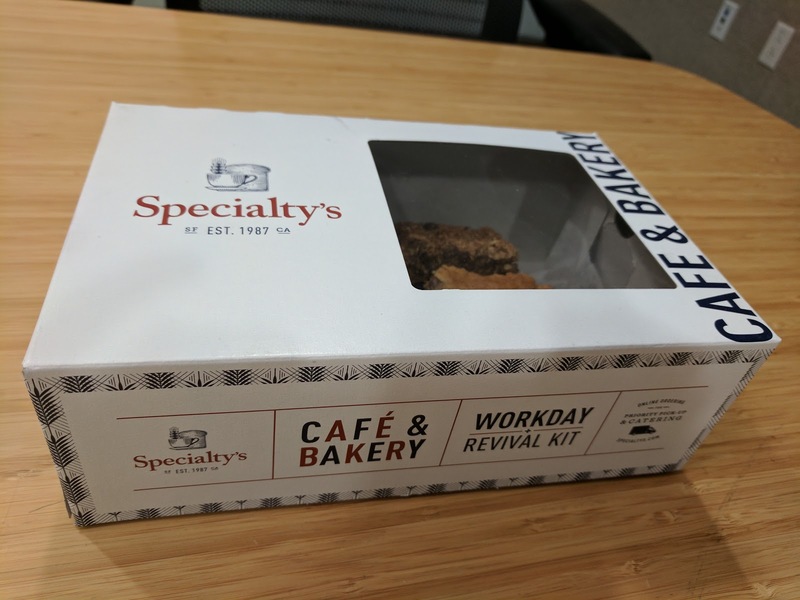 When I moved to San Francisco, I was not familiar with the Specialty's bakery chain. It didn't take long for Specialty's to get on my radar though, as their shops are located all over town. There is one area of the Financial District where they seem nearly as common as Starbucks, and all have rows of baked goods lining the display cases. You know how much I love baked goods. The real kicker though, is whenever you walk by, the most delightful smelling aroma wafts out, drawing you in. Impossible to resist. And they really do bake fresh in the shops daily, making the "bakery" part of the name accurate. My first impression of Specialty's? ZOMG everything is huge! Seriously. The cookies, muffins, and scones are all monstrously large. They are basically meals (and, with cookies clocking in at 500 calories each, scones and muffins at 600 each, they kinda are). Oh, and the pecan sticky bun? 770 calories! The actual meals, sandwiches, can be 1000+ calories too. Wowzer. They go big here. Anyway. Specialty's is a chain mostly with locations in California, but they have a few in Seattle and Chicago. 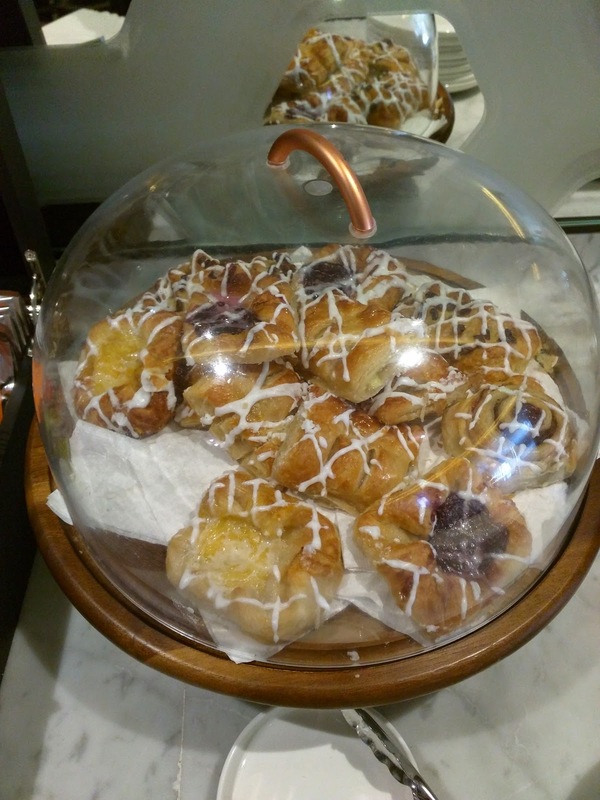 In addition to the enormous baked goods (muffins, scones, croissants, coffee cake, danishes, cookies, brownies, bundt cakes, mini pies), they also make sandwiches, soups, and salads, standard cafe fare. They seem to do a huge catering business, along with serving the needs of office workers nearby. Some of the shops have seating, but, for the most part, this is somewhere people grab a sandwich or treat, and go. No ambiance, not a destination to spend time in. Over the years, I've tried a number of items from Specialty's, some that I picked out and purchased, others at events where they catered. My overall impression is that Specialty's is ... good, but not particularly special (except for the Zucchini Bran Muffin, which is totally incredible. But they no longer make it). I wouldn't ever seek Specialty's out, and it doesn't compare to a smaller, independent bakery, but there goods are better than what most cafes sell. As I mentioned, the cookies are insanely large, and, insanely bad for you. Not that a cookie is usually a healthy treat, but, 500 calories in a single cookie? Crazypants. Anyway, as you know, cookies are not usually my treat of choice, but, they are also the item folks tend to bring in to the office the most, so, they have a habit of finding their way to me. 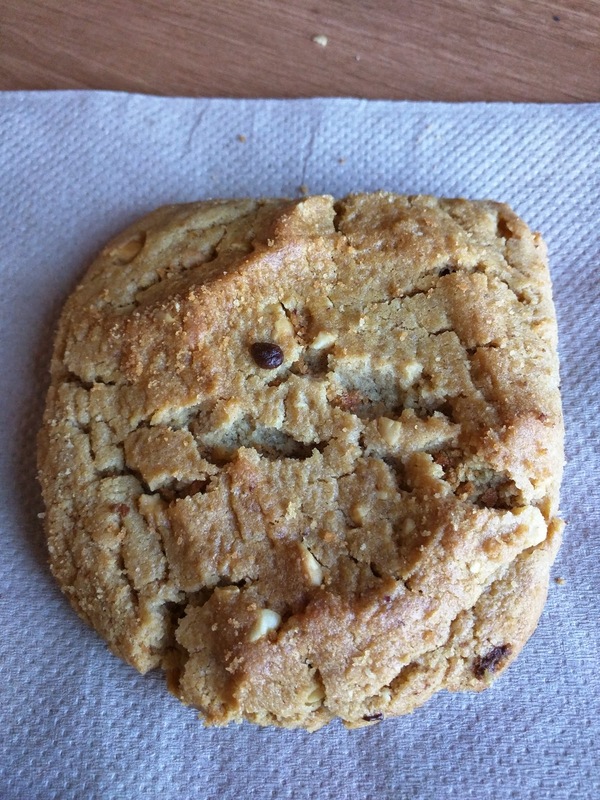 Specialty's has an amazing feature: the warm cookie radar. You can, from the website, search for the warmest cookie nearby. Or, find out how many minutes it has been since your cookie of choice was pulled out of the oven at all the shops in town. And, if you want to replicate the cookies fresh out of your own oven, they sell some baking mixes. "Every bite of our fresh-baked classic chocolate chip cookie is filled with smooth and creamy Guittard® milk chocolate chips." This is probably their most famous cookie. A total monster, very thick, somewhat cakey, soft. The chocolate chunks are huge, and the milk chocolate very creamy. If you like creamy milk chocolate, you'll love this. The cookie itself is sweet and buttery. A fairly good version of a chocolate chip cookie, but, not mind blowing. Ojan was a fan. The shape is a little funny, not quite round, not square. I also tried the Semisweet Chocolate Chunk, the same style, just with Guittard® chocolate chunks rather than milk chips. It was again, a very thick cookie. I only had small piece but it seemed like decent cookie. "Our unique take on this cookie combines creamy white chocolate and dark Guittard® chocolate chunks in a rich, dark cocoa cookie dough to fulfill a chocolate-lover’s dream." This was another very heafty cookie. It weighed a ton. 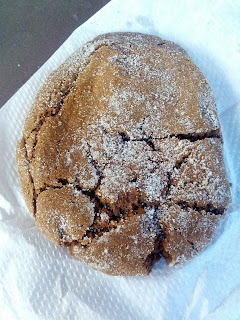 It was a very dense cookie, with a rich chocolate flavor from the Guittard® dark chocolate. The thickness and the rich flavor made it almost like a brownie. It was loaded with huge white chocolate chunks, super sweet and creamy, and a nice contrast with the deep rich chocolate. 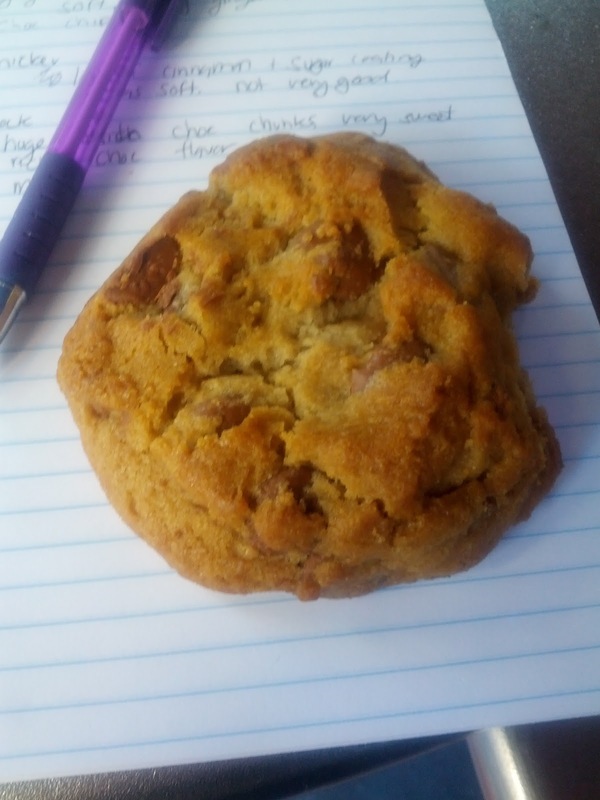 This variety was crisper than some of the other cookies, not quite as soft. My turned out to be my favorite of the cookies; I loved how chocolatey it was, and although quite generic, the sweet white chocolate was tasty. "Our rich peanut butter cookie brings tons of peanut flavor with chopped peanuts and pure Jif® peanut butter. You’ll clamor for milk." This one looked like it had potential, tons of little chunks of peanuts inside. 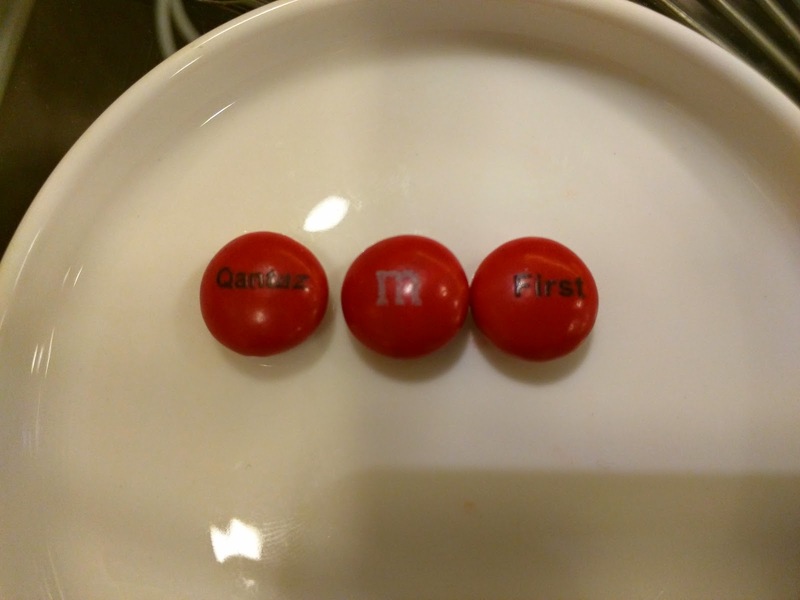 Yet the peanut flavor somehow wasn't very pronounced, and it was hard and oily. Also, Jif® seemed like a funny choice of ingredient quality, particularly compared to Guittard®. I really didn't like this one, but Ojan did. Peanut Butter Chocolate Chunk Cookie. "Our soft, fresh-baked cookie is rich with roasted peanut flavor from Jif® peanut butter and loaded up with smooth Guittard® semisweet chocolate chunks and chopped peanuts." And, putting together the previous cookies, you get the peanut butter chocolate chunk. 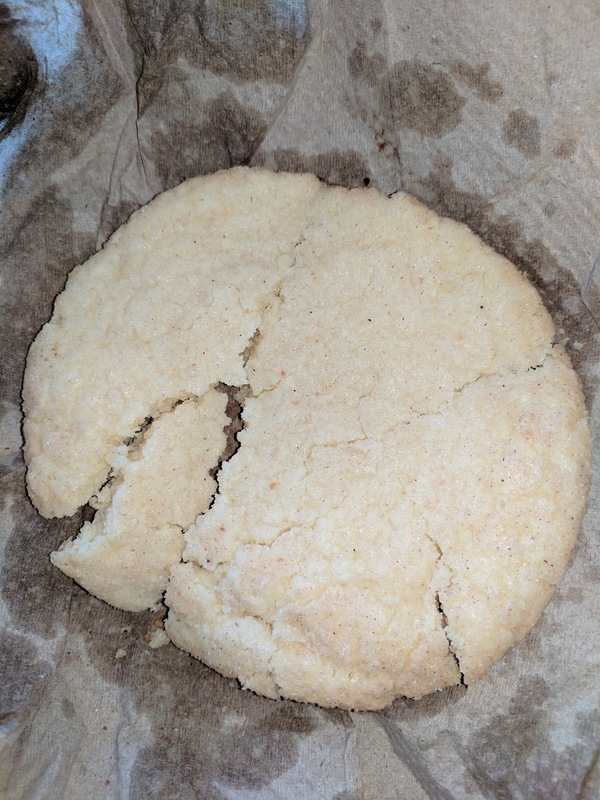 It was another large cookie. Just like the peanut butter, there were lots of peanut chunks, but no real peanut flavor. The chocolate chunks were the same as in other cookies. So, basically exactly what you'd expect from mixing the above cookies, but a missed opportunity, since chocolate and peanut butter are such a great combination! "We load these moist and chewy fresh-baked oatmeal cookies with plump raisins to produce an old family favorite." 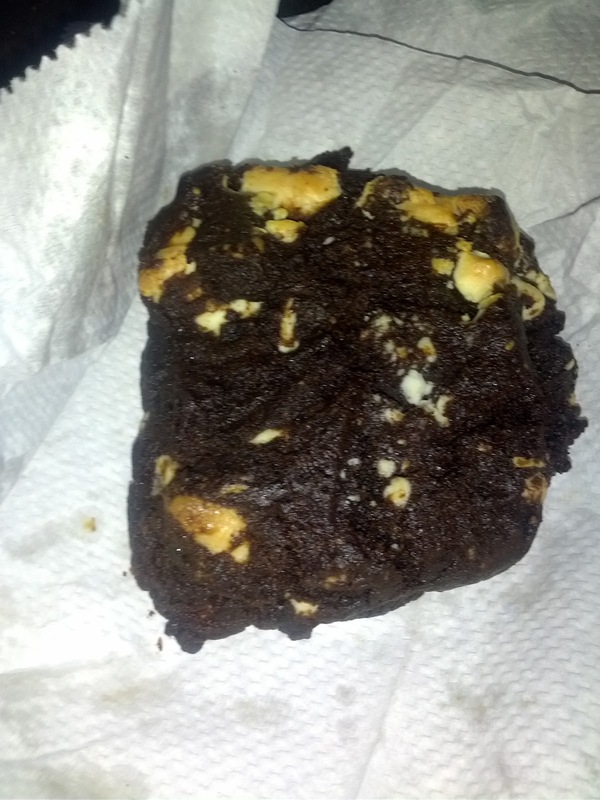 This was a different style than all of their other cookies, square shaped rather than round-square. It was still thick and heafty though. It was very spiced, far more than I expected, which was kinda nice, a bolder cookie. I didn't love the flavor though, nor the raisins, nor the oats. I did appreciate the heartiness. But ... meh, who really wants oatmeal raisin? "This irresistible sugar cookie puffs up as it bakes and provides a tender center with a crisp exterior finished with crackled cinnamon sugar." And yet another huge, thick, cakey cookie. It was far more round than the others. It was sweet and buttery, with lots of cinnamon and sugar on top. I don't really like snickerdoodles though, so this was pretty meh to me. I didn't love the snickerdoodle the first time, but, I had slim pickings when I made it to the cookie box one afternoon, when a co-worker brought in cookies. Plus, it looked better this time. It was better in some ways, very soft, a nice texture. But really just a plain sugar cookie, that really lacked a homemade taste. It also had much less cinnamon and sugar on it this time around. "A traditional New England holiday favorite. 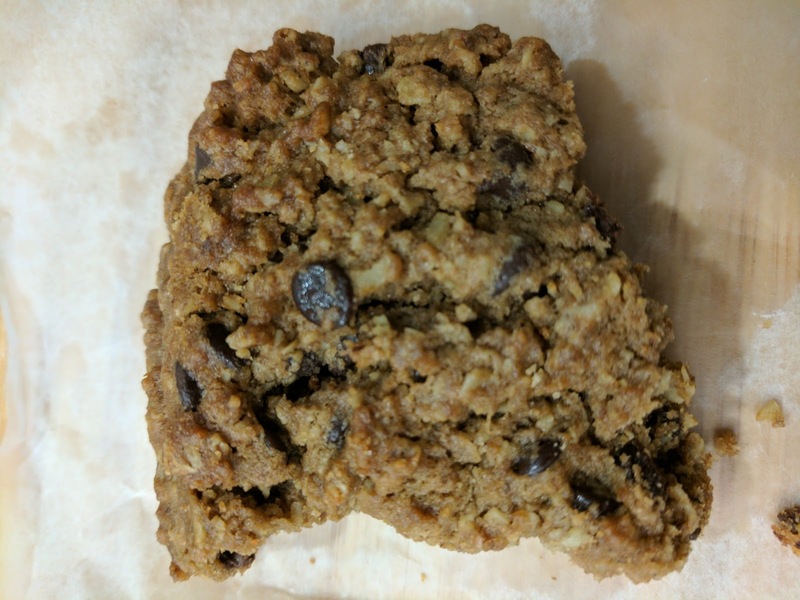 We combine rich blackstrap molasses and ginger and bake this cookie to sugar-crackled perfection." This was even softer than the others, almost gooey inside. It had a strong ginger flavor. And tons of sugar on top. 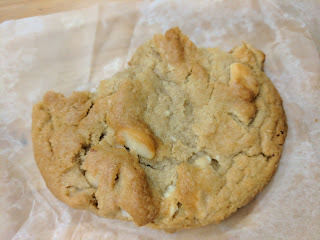 My second favorite Specialty's cookie, I really liked how soft it was, and the flavor popped. I could do without all the extra sugar on top though, it didn't highlight the flavors in any way. "Incredibly tender tea cookies are loaded with finely ground toasted pecans then dusted with powdered sugar in this crunchy, sweet and satisfying classic." This was a huge shortbread, with bits of pecan in it, covered in glaze, and covered in powdered sugar. Another monster, like all of their cookies. The size seemed even more crazy for a tea cookie, it was very heavy, very dense. I almost liked this one. 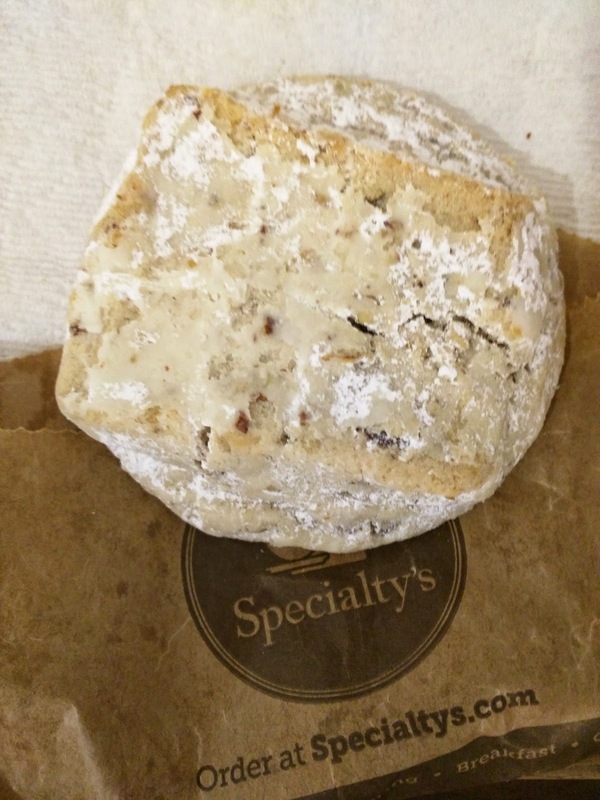 It was crumbly and softer than all of the other Specialty's cookies, which I liked. But it wasn't buttery enough for me. The pecans added a nice crunch, and the powdered sugar made the whole thing nicely sweet. Overall, just not as flavorful as I'd like. It would pair nicely with tea though, hence the name I guess. I think it was basically a Mexican wedding cookie. "The classic combination of chewy oatmeal and creamy Guittard® milk chocolate chips is joined by the positive health benefits of wheat germ. The result is a delicious and wholesome fresh-baked cookie." Hearty from oats and wheatgerm. I really liked how hearty it was, yet rich too. Buttery and decadent, yet healthy tasting? Who knew that was possible! 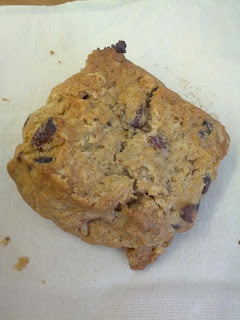 Much better than the other hearty choice, the oatmeal raisin. "Some flavors just naturally go together. We take crunchy macadamia nuts and surround them with creamy white chocolate chunks for one of our most popular fresh baked cookies. We are bringing back this seasonal favorite for a limited time." 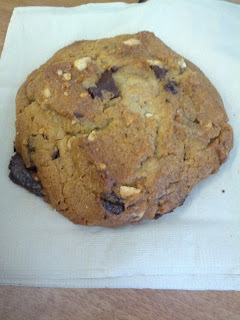 I liked the sweet white chocolate, and the crunchy nuts, but the base cookie was fairly boring. If you thought the cookies were huge, wait until you meet the scones. All 600 calories of them. Available in four flavors, blueberry, cranberry, almond, or cappuccino. Wild Blueberry: "We mix delicious blueberries into our handcrafted tender butter scone and bake it to a golden brown before finishing it with a turbinado sugar crown." Tasting notes: Huge, huge, huge baked good. I wish I had a photo with something else in it so you could see how large this thing was. It was more cakey that I'm used to in a scone, almost like a muffin, just a bit harder, and flatter? Topped with a generous amount of large sugar crystals, which I did like. The base was not very flavorful though, and even the blueberries didn't provide much flavor pop. Cranberry: "We mix tangy Craisins® into our handcrafted tender butter scone, bake it to a golden glow and then finish it with turbinado sugar" Tasting notes: Hard scone, with some tart cranberries, big sugar crystals on outside. The scone itself doesn't have any particularly good flavor, kinda crumbly, meh. Also .. Craisins? really? Someone brought in a box of these muffins, so I got to try a few. Alas, in the mad rush for muffins with my co-workers, I failed to get a photo. Zucchini Bran: Tasting notes: Delicious! Great hearty flavor and texture from the bran. It doesn't look appetizing, but is really tasty. I really, really like this, and it is my favorite of all their products. If only they still carried it. 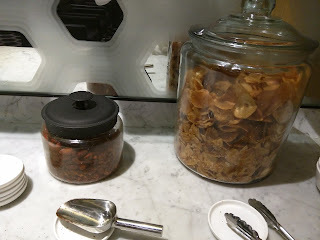 Carrot Raisin Bran: "A hearty morning muffin starts your day right with a mixture of fresh grated carrots, plump raisins, Dole pineapple, thick oats and bran. " Tasting notes: I only had a small chunk of this, but seemed pretty good. Yogurt Blueberry: Tasting notes: Loaded up with tons of moist blueberries. I didn't really taste the yogurt, but it had some strange spicing to it. Couldn't really decide if I liked it or not. This was replaced by a blueberry crumble muffin, with a crumble top, and no yogurt. The coffee cakes are round, topped with glaze, and available in four flavors (blueberry, fuji apple, peach, and cranberry. The cakes themselves aren't awesome, but, the streusel toppings were great. Fuji Apple: "We top our fresh-baked, spiced coffee cake with buttery cinnamon streusel crumble and sweet Fuji apple slices and then finish it with a swirl of almond icing." Tasting Notes: The base to this wasn't very interesting, just kinda plain cake. It was soft enough though, even though I had it a bit old. On top were some slices of cooked down apple, spiced I believe. They were mushy and just apples, so, not really my thing. A drizzle of decent icing was over the top of everything. Overall, meh. Except ... for the streusel! I loved that, good cinnamon flavor, sweet, crumbly. Who needs the cake part? Blueberry: "Our signature tender coffee cake is baked fresh and topped with buttery spiced brown sugar streusel crumble and juicy blueberries and finished with a swirl of almond icing." Tasting notes: Coffee cake, drizzled with icing. The cake was very soft and moist. It reminded me of standard birthday cake though, not a coffee cake, as it didn't have any tang or other defining characteristic to it. The blueberries were plentiful, very plump, and juicy, and very flavorful. Strange how different the blueberries here are than in the scone. I liked the drizzle of icing on top for sweetness. But, the best part was the streusel topping! Cinnamon-y, crumbly, crunchy, sweet, very good! Cinnamon Roll with Cream Cheese Frosting ($2.79): "Thick, soft layers of sweet bread, with lots of cinnamon and rich cream cheese frosting." Tasting notes: I only had a small chunk but didn't seem standout. Orange Poppyseed Bundt Cake ($2.39): "Our treat-sized, delicate vanilla cake infused with real orange zest and poppy seeds and finished with our classic creamy vanilla icing." Tasting notes: good crunch from the poppy seeds, nice citrus flavor, glaze tasty. Had it a day old after it had been sitting out so it certainly wasn't fresh, but it was not bad. Orange Cranberry Breakfast Bread ($2.39): Tasting notes: I don't like cranberry very much, and it was very pronounced in here. Lots of icing on top too. Seemed strange to call this a "bread"(or even a breakfast item), as it seemed more like a sugary dessert. For breakfast, in addition to all the baked goods, Specialty's also offers oatmeal, yogurt, egg and cheese breakfast sandwiches, quiche, and ciabatta. The ciabatta is rather fascinating, basically, their offering rather than bagels. The egg and cheese breakfast sandwiches, and many of their lunch sandwiches, come on the ciabatta, but they are also sold with cream cheese, exactly like a bagel. They come in two varieties, "country" or poppy seed. For catering, you can even order the "Better Than Bagels Platter", with ciabatta and cream cheese. 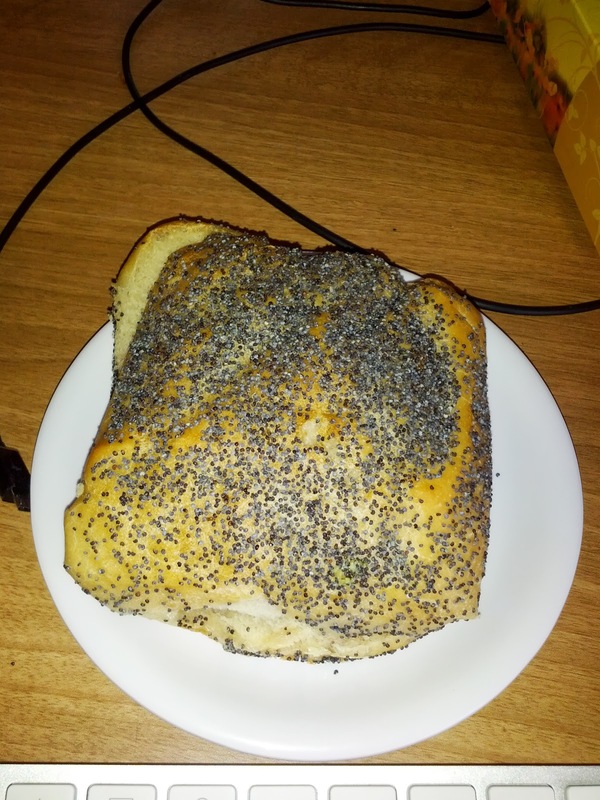 "A single serving of our fresh-baked, handcrafted country ciabatta topped with black poppy seeds." This was really fascinating. It really was almost like a bagel, sans the hole. It had a slight crust on the outside, yet was soft inside like a bagel, and had tons of seeds on top like a bagel would. It had a nice flavor from the plentiful coating of seeds. The ciabatta was a bit buttery, almost reminding me of a focaccia, clearly tastier than standard bagel dough. It was quite good, and I'd actually pick it over a bagel any day. It was pretty good just room temp with cream cheese, but it was even better when toasted. I added cream cheese, smoked salmon, red onion, and capers and I must say it was pretty incredible. It probably does make a nice breakfast sandwich with eggs and cheese too. After a few bites I decided it really was better than a bagel. It also kept fine for a day. I also tried the more basic Country version, no seeds. It was a basic ciabatta, but still good. Slightly crusty, but soft inside. Nice flavor to it, I think from lots of butter. Again, a winner. As for their cream cheese, it is pretty standard cream cheese, but I appreciated that it is whipped. Fluffy cream cheese is so much better. I also tried the basil pesto whipped cream cheese, equally fluffy, with a nice flavor from the pesto. Went really well with the poppyseed ciabatta. I haven't had much from the regular food section of the menu, but they make a variety of salads (entree sized or sides like cole slaw), soup, and sandwiches. Sandwiches are available on a variety of sliced breads (or ciabatta), and some come toasted. But, not being a sandwich lover, I haven't ever sought these out. 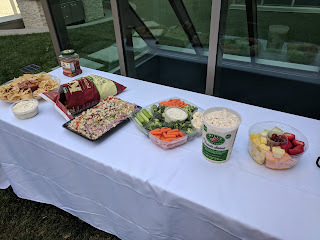 Then, one day I was at an event, and, Specialty's did the catering, so I was able to try a few of the sandwiches, served on platters as finger sandwiches. Veggie Finger Sandwich: "Swiss and provolone with fresh lettuce, tomato, onion, pickle, italian vinaigrette and black pepper, avocado, mushrooms, bell peppers, cucumber, pepperoncini, sprouts, stone ground mustard, ranch and mayo on toasted thyme focaccia. " Tasting notes: The focaccia was really tasty, good herbs on the outside, nice and buttery. 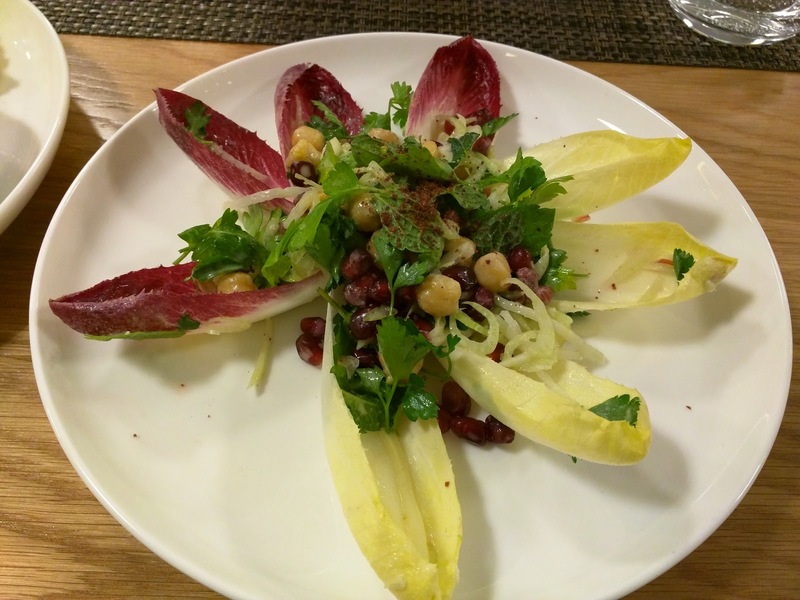 Filled with lots of veggies, which seemed fresh enough, but were not really flavorful. The veggie mix was a little strange ... sliced mushrooms and pepperoncini in a sandwich? The cheese was very generic, sliced, not very flavorful. There was tons of ranch and mayo, totally dominating the other flavors. This didn't come together at all, it was like a sandwich that someone would throw together by putting everything they could find in their fridge of into a single sandwich. Meh. The Chairman Finger Sandwich: "Oven-roasted turkey breast and swiss with fresh lettuce, tomato, onion, pickle, italian vinaigrette and black pepper, avocado, cucumber, sprouts, ranch, stone ground mustard and mayo on toasted thyme focaccia." Tasting notes: Again, I liked the focaccia, but that was about it. There was way too much lettuce in here. The turkey wasn't great. And tons of mayo. Crudite Platter: "Sliced cucumbers, red and green bell pepper, carrots, cherry tomatoes and house-made buttermilk ranch dressing." Tasting notes: Very mediocre crudite platter. Veggies weren't limp or anything, but didn't really have flavor. Ranch dressing was also flavorless. Another day, I went to a summer BBQ. Most of the food came from Costco (potato salad, veggie and fruit platters, chips, etc), but someone brought a salad from Specialty's (next to Kettle chips), the Chinese Chicken Salad. "Vibrant Asian-inspired flavors and crunch! Our signature Asian salad blend of fresh cabbage, grated carrots, green onions and cilantro is topped with natural oven-roasted chicken breast, hand-sliced red bell pepper, red onion, crispy wonton strips and black sesame seeds. Enjoy with our sweet-tangy Pan-Asian dressing on the side. " The host actually forgot the dressing and wontons, so I tried it without. Fresh, crispy cabbage and carrots formed the base, and I enjoyed it. I avoided the little chunks of chicken and the red bell peppers, but appreciated the additional zing the green onions added, and the sesame seeds gave a bit of extra crunch. Once the dressing was found, I had another salad, this time with dressing. Interestingly, I liked it less. The dressing was just too sweet for me, and masked all flavor in the fresh veggies. Overall though, a decent salad.